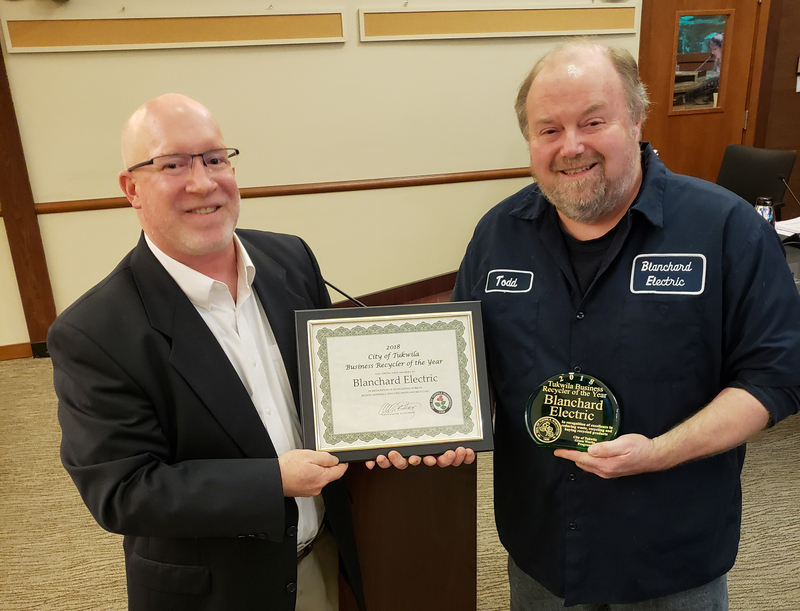 The City of Tukwila is pleased to announce Blanchard Electric as the 2018 Tukwila Business Recycler of the Year! Blanchard Electric is a major supplier of electrical units and parts to truck, industrial and marine markets in the Puget Sound region and have been in business since 1942. Blanchard Electric has an extremely impressive recycling rate of 98% thanks to an aggressive reuse program. Materials like bags, packing materials, Styrofoam and pallets are all reused to prevent waste. Congratulations! More information on becoming a Tukwila Green Works member and gaining recognition for your business’s waste prevention efforts can be found on the City’s Recycling and Waste Prevention Services page.